The reasons we participate in therapies like yoga and foam rolling are numerous, but one of those is to release the fascia. The fascia is a layer of thick connective tissue that encases the entire body. It suspends our muscles in place which allows them to slide and glide as we move. When our fascia is restricted, so is our movement, and if it isn’t released in some way, it solidifies. You know that “stiff” feeling you wake up with in the morning? That’s due to the solidifying of this tissue—it isn’t sliding anymore, which is why a good, long stretch feels so great first thing in the morning. Foam rolling essentially massages the fascia, encouraging it to release so we can move more effectively and more fluidly. Like anything, when you do it consistently, you’ll notice that those “every day” aches and pains start to disappear and your range of motion will increase tremendously. Here are some of my favorite techniques. If you’re new to foam rolling you can start off with a quick 5 to 10 minute routine in total and can work up from there. Your body will thank you, I promise! Lie on your side, using your hands for support. Bend the top leg to unload some of the pressure and maintain balance. Roll from your hip down to the knee and be sure to rest on any soft spots to encourage release. Sit down on the meaty part of the muscle and roll around to release. Use one or both legs to increase or decrease the amount of support. 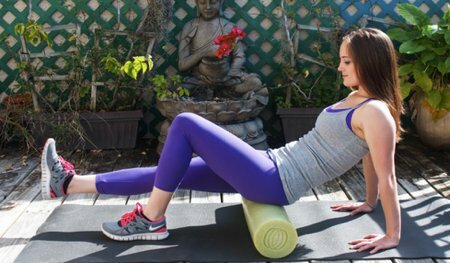 Lie on the roller and roll from hip to knee using one foot extended to balance if necessary or if pressure is too intense with both lifted. How’d it work?! Let me know in the comments below, or share YOUR favorite foam roller move!